This letter was written by 34 year-old Pvt. George Benton Aldrich (1828-1908) of Company B, 48th Ohio Infantry. He was the son of William and Elizabeth Aldrich of Delaware County, Ohio. He was married to Mary Martha Bixby (1831-1918) in 1849 and had at least six children by the time this letter was written in March 1862. 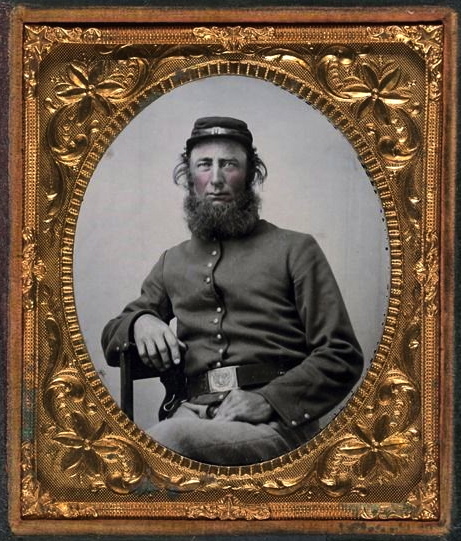 He enlisted on 11 November 1861 and was honorably discharged on 24 October 1862 after receiving a shell wound to his left hip/leg during the Battle of Pittsburgh Landing or “Shiloh.” On 16 April , a little over a week after the battle — Pvt. Aldrich was loaded onto a transport for the trip to Camp Dennison near Cincinnati, Ohio, where he convalesced. He then enlisted in Company G, 88th Ohio Infantry in July 1863 at Camp Chase Ohio. As a point of curiosity, it is noticed that a son was born to George and Mary Aldrich on 15 July 1862 — just three months after the Battle of Pittsburg Landing where George was wounded — and the couple decided to name him Shiloh Landing Aldrich! Company B, 48th Ohio Reg. It is with pleasure that I take my pencil in hand to let you know that I am well ay present and I hope that when these few lines gets to hand that it may find you in good health. We have got in the enemy’s country but we haven’t seen any devils yet and I don’t think that we will. But still we may. We had a good time coming here. I am about 1200 miles from home and in the woods. We have took our camp on the battlefield of Pittsburg.¹ The battle was fought on the 4 of March. It was not a hard fight. The Rebels buried their dead. I said that they had buried their dead but they just throwed a little dirt over them for we could see their noses sticking out of the ground. We haven’t got our pay yet. Our payroll was made in camp Dennison and we was marched away before we had time to get it, but as soon as we get paid, I will pay you all that you have done for me. I am here without money and without a chew of tobacco or a ____ shred of paper. We have captured some corn as we come up the river but I don’t know how much but about three thousand bushels and some wood to run the boats. Our troops captured 80 bales of cotton and prisoners yesterday. I want you to write to me how you and I stand and how things is a getting along and the folks is around Norton and my folks is getting along and how much they have in debt there and the general opinion of the war is there. I send my respects to all the friends. No more at present but remain yours bravely. Write soon. Direct to Paducah, 48th Ohio Regiment on the march. ¹ This is not a reference to the Battle of Pittsburg Landing, or “Shiloh,” which did not take place until April 6-7, 1862. Rather it is a reference to a minor engagement on Saturday, 1 March 1862, in which the gunboats Tyler and Lexington attacked a rebel battery of six guns, supported by two regiments of infantry and one of cavalry at Pittsburg River. Under cover of the grape and shell of the gunboats, some sailors, and two companies of Illinois sharpshooters landed and destroyed a house where the battery had been placed. The after action report for the engagement claims that from seventy to eighty Rebels were killed. This entry was posted on Tuesday, May 6th, 2014 at 7:49 pm	and posted in Uncategorized. You can follow any responses to this entry through the RSS 2.0 feed.